A celebration not to be forgotten by the Chinese, especially those who observe Chinese culture very closely – Dragon Boat Festival is its name. The Dragon Boat Festival (端午节, Duan wu jie), also known in English as the Rice Dumpling Festival, is a celebration observed largely by many Chinese around the globe, especially in areas with dense Chinese populations such as China, Taiwan, Hong Kong, Malaysia and Singapore. The Dragon Boat Festival falls on the fifth day of the fifth month in the Chinese Lunar calendar. In the Gregorian Solar calendar, which is the calendar that we commonly use today, this festival would fall somewhere in late May to mid-June. Now, some of you must be wondering, why is this festival called the Dragon Boat Festival? Well, as the name suggests, one of the most prominent activities during this festival is the dragon boat race held in large rivers. I will discuss more on this in the later part of this article. Ok, if this celebration is called the Dragon Boat Festival because of such a reason, then you may also wonder as to why this festival is also alternately known as the Rice Dumpling Festival. This, then, is due to the fact that another main activity during this festival is eating rice dumplings wrapped in bamboo leaves. If we were to directly translate “Dragon Boat Festival” into Mandarin Chinese (which would be 龙舟节, Long zhou jie), it does not truly reflect the meaning and significance of this festival to the Chinese. On top of that, Long Zhou Jie is not the term used in Mandarin Chinese to refer to this festival, but rather Duan Wu Jie (端午节). Duan Wu Jie, if literally translated into English, would somewhat mean “Solar Maximus Festival” or “Summer Solstice Festival.” It is generally accepted that this festival is known as Duan Wu Jie (端午节) in Mandarin Chinese and the Dragon Boat Festival in English. Now, why is the Dragon Boat Festival celebrated? Well, there are two main reasons to this. The first reason has something to do with the sun. According to Chinese traditions, the fifth day of the fifth month in a year is the time of summer solstice, when the sun is the hottest and brightest. On this day, daytime is the longest in the Northern Hemisphere, where China is located. Hence, the Dragon Boat Festival or Duan Wu Jie is observed in conjunction with the summer solstice. In Chinese culture, the sun and the dragon are associated with males, whereas the moon and the phoenix are associated with females. 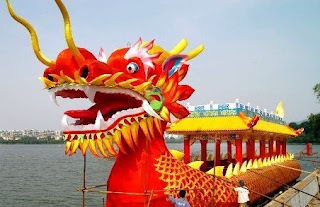 Because of this, the dragon is associated with the summer solstice, when the sun is at its most powerful, thus bringing about the dragon as the ultimate symbol during the Dragon Boat Festival. The Chinese also tend to associate the Dragon Boat Festival with the males, whereas another Chinese festival known as the Winter Solstice is associated with the females. In Japan, the Dragon Boat Festival corresponds with the Japanese festival of Boys’ Day, due to the fact that this festival is associated with males in accordance with Chinese beliefs. The Japanese festival of Boys’ Day is presently known as Children’s Day (こどもの日, Kodomo no Hi). The second reason as to why the Dragon Boat Festival is celebrated by the Chinese is to commemorate the death of renowned Chinese poet Qu Yuan (屈原). Qu Yuan (340 B.C. – 278 B.C.) was a gifted poet and capable minister in the ancient state of Chu (楚) in China, during the Warring States Period (战国时代). He was an upright minister who denounced corruption and fought incessantly against it in the imperial court of the state of Chu. As a result, he was greatly favoured by the King of Chu, but this aroused the jealousy and hatred of other ministers who were corrupt. They conspired against Qu Yuan and accused him of being corrupt himself. They succeeded in getting the King to believe their accusations, thus influencing the King to banish Qu Yuan from the imperial service. 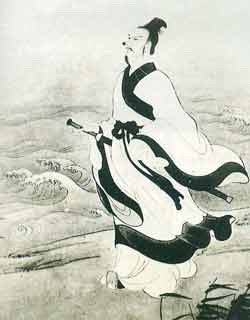 Qu Yuan was so upset that he decided to commit suicide by drowning himself in a river. However, his uprightness and fight against corruption gained him the respect and admiration of the people, and he was greatly loved by the people of Chu. Now, let me discuss more about the main customs practiced during the Dragon Boat Festival. Basically, as the name itself suggests, dragon boat races are a must during this festival. During this festival, if one were to visit a riverside in any region with dense Chinese populations, one would see many dragon boats being paddled along the rivers in dragon boat races. The dragon boats used may vary in size and shape, depending on the creativity of its owners. Dragon boats are long and narrow boats paddled by manpower. A dragon boat has the design of a dragonhead carved at its front end, while a dragon tail is carved on its back end. 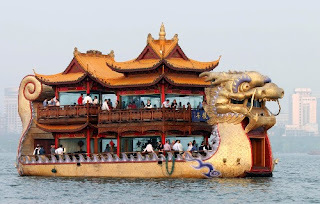 The body of the boat is carved to resemble that of a dragon as well. Hence, the entire boat resembles a real dragon. Dragon boats are sometimes adorned with lamps and lanterns, especially if the dragon boat races are held at night. During dragon boat races, drums and gongs are carried aboard and sounded throughout the entire race. The tradition of carrying and sounding drums and gongs can be traced back to the story behind the Dragon Boat Festival, whereby the people of Chu sounded their drums and gongs as they went searching for Qu Yuan’s body in their dragon boats. This was to frighten away fishes so as to prevent them from eating and destroying Qu Yuan’s body. 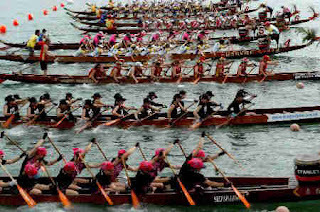 In dragon boat racing, a dragon boat is normally rowed by many people, depending on the size of the boat. A dragon boat can be paddled by up to 80 people. A drummer and flag-catcher will normally stand in front of the boat, with the drummer drumming all along the race. In the race, all teams will endeavour to paddle their boats as fast as possible along the river. The team which is the first to reach the end of the course and grab a flag placed there is declared the winner. This practice of dragon boat racing during the festival is associated with the story of Qu Yuan, when the people of Chu set out on their dragon boats along the rivers in search of Qu Yuan’s body. They somewhat “raced” to be the first to discover the body of the unfortunate poet. Another main custom practiced by the Chinese during the Dragon Boat Festival is the eating of rice dumplings wrapped in bamboo leaves. These rice dumplings, known as zongzi (粽子) in Mandarin Chinese, are made especially for this festival. They are made of glutinous rice with a variety of fillings in it. Amongst the fillings commonly used are dates, meat, salted egg yolk, beans, fruits, walnut, sweet potatoes and mushrooms. Normally, one would use a combination of these ingredients to be used as fillings for the rice dumplings. After placing the fillings into the glutinous rice, the lump of rice is shaped into specific shapes. Nowadays, one can find rice dumplings of many shapes, triangular and pyramidal being the most common ones. Once shaped into the desired shapes, the rice dumplings are then cooked by boiling or steaming them. After this, they are wrapped with bamboo leaves before being served. Traditionally, bamboo leaves are used to wrap the rice dumplings before serving them, but since bamboo leaves are hard to obtain outside China, some Chinese communities, especially those outside mainland China, prefer to use other types of wrappings instead, such as banana leaves or plastic wrappings. Once wrapped, these rice dumplings, or zongzi, are ready to be enjoyed! 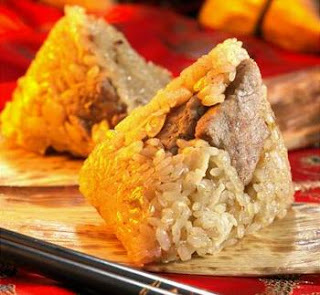 The custom of eating rice dumplings during the Dragon Boat Festival is linked with the story of Qu Yuan as well. After Qu Yuan committed suicide by drowning himself in a large river, the people set out in dragon boats to search for his body. As you know, he was a poet and minister in the Chu imperial court who was greatly loved and admired by the people of Chu. Out of pity for him, the people of Chu made lots of rice dumplings wrapped in bamboo leaves at home and brought them out in their dragon boats in order to feed them to the river fishes. This was done in the hope that the fishes would eat the rice dumplings instead of Qu Yuan’s body, thus his body would be left undisturbed. 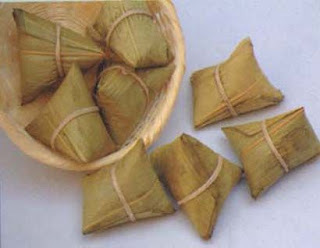 Since then, rice dumplings wrapped in bamboo leaves have been a significant part of the Dragon Boat Festival up to now. The Dragon Boat Festival is considered to be the third most important Chinese festival, after Chinese New Year and Mid-Autumn Festival. Its popularity has undoubtedly attracted the attention of communities around mainland China from ancient times, up to the extent that such communities have adapted the significance of the Dragon Boat Festival into their own societies. 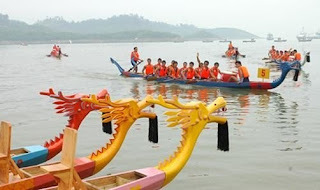 For example, festivals such as the Japanese Boys’ Day (or Children’s Day), the Korean Dano Festival and the Vietnamese Tet Doan Ngo are all adapted from the Chinese Dragon Boat Festival. 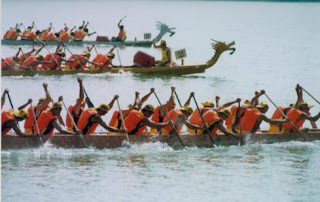 Nevertheless, its popularity has also spread to the Western world, as dragon boat races are now rather popular and commonly held in some European countries. The teams will each pick a team name, color, T-shirt, and theme for theirboat to act as a unified well-oiled, human-powered machine on water for a unified purpose of beating cancer.